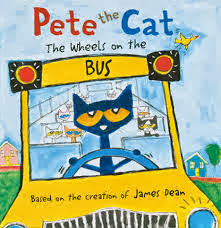 We read Pete the Cat The Wheels on the Bus. Then we danced to the video on You Tube. Then we used this fun freebie from Kathleen at Growing Kinders to practice one to one, counting to 5, counting backwards, counting from right to left and left to right, cardinality, and conservation of number. We also looked at all the different ways we could make 5. We used the counters here to solve story problems, count the kids in various ways, and decompose the number 5. We turned the mat over and moved the kid counters around to work on conservation of number. Check out Kathleen's post and her fun Lakeshore kid counters here. My kids LOVE that video!